Can a modern cross pulpit add a contemporary element that will complement sermons, readings, ministry, or other pastoral or educational speaking? 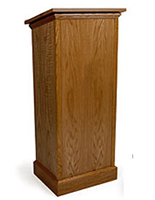 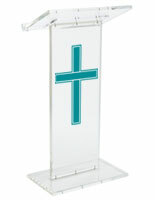 Podiums2go.com offers a wide selection of high quality printed crucifix lecterns in traditional wood, classic metal truss, and high-tech acrylic and plexiglass designs that will complement any place of worship's environment or decor. 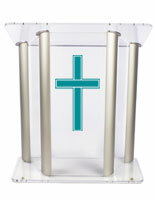 Each specialized modern cross pulpit is designed to focus the attention of congregations, audiences, and listeners in churches, sanctuaries, auditoriums, and conference halls. 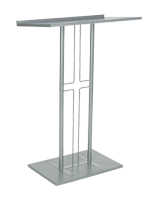 Commercial grade materials and up-to-date manufacturing methods allow us to produce speaker or preaching stands that will last for many years. 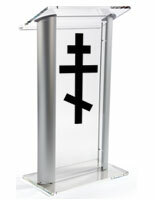 The elegant modern cross pulpit, also known as a custom church lectern with printed ecclesiastical decoration, differs from standard podiums because of the cruciform graphics and religious symbols. 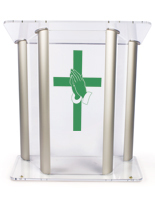 Our selection includes a wide variety of fabrication materials, including traditional carved wood, welded open metalwork, and a full roster of printing options with spot or full-color graphics in selection of decorations with different ecumenical symbols. 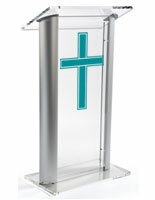 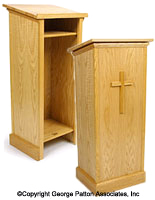 Designed specifically for clerical and pastoral environments, these contemporary ministry podiums with crosses are a perfect addition to any church, meeting house, school, sanctuary, or congregation. 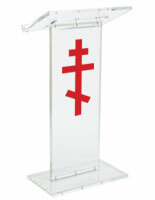 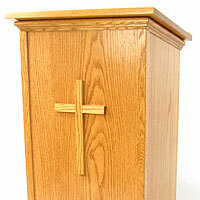 What are the different styles of lecterns with crosses or other religious symbols? 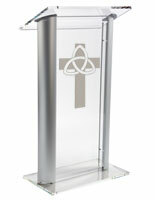 Welded metal cross pulpits feature an openwork steel or aluminum construction that gives an open, contemporary feel. 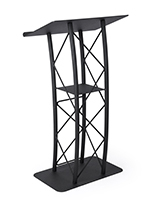 These sturdy podiums feature a design that is formed by the body of the fixture itself for a unique look. 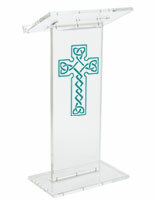 Classic wooden lecterns with traditional, celtic, and orthodox crosses feature solid construction made of either manufactured or natural wood with an engraved or embossed crucifix on the front. 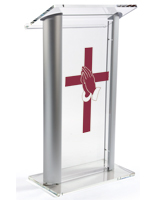 Lightweight laminated materials allow elegant new designs that feature curved or tapered lines that update the traditional wood preaching stand for eye-catching looks that attract and keep attention. 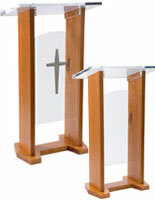 In addition, laminating can give church furnishings the look of expensive luxury woods at a fraction of the cost and using environmentally-friendly materials. 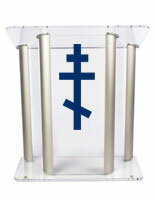 High tech plastic pulpits decorated with religious symbols are made of materials such as acrylic, plexiglass, and similar polymers. 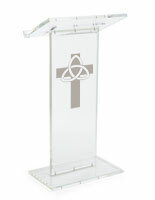 These lightweight church lecterns in clear, frosted, or multicolor designs create a truly contemporary look when decorated with symbols of faith. 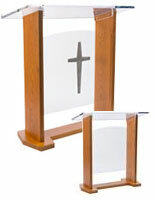 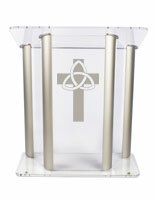 In addition to imprinted crucifix designs, many ecclesiastic or clerical podium styles combine transparent plastic with wood or metal elements to create ministry and church furniture that reflects the vibrant and relevant nature of their mission. 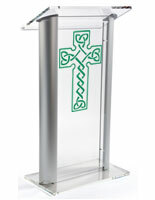 Lecterns decorated with orthodox, traditional, and celtic crosses and other ecumenical symbols of faith represent a beautiful blending of the traditional and the contemporary. 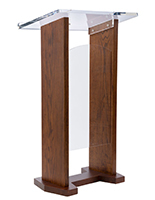 Designs and materials range from classic wood-finish speakers stands to sleek and portable acrylic constructions suitable for any generation. 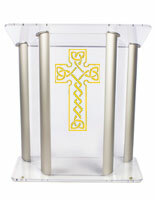 In addition to the selection of cross imprints shown here, full color printing is available for fully customized podium designs, including custom church podiums with a variety of religious symbols. 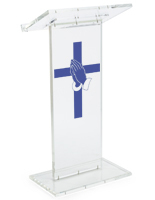 Whether used in traditional houses of worship, in fellowship meetings, at ministries, conferences, or in outdoor congregations, our wide selection of high quality ecumenical ministry and church podiums with engraved or imprinted Christian symbols are perfectly suited for any venue.